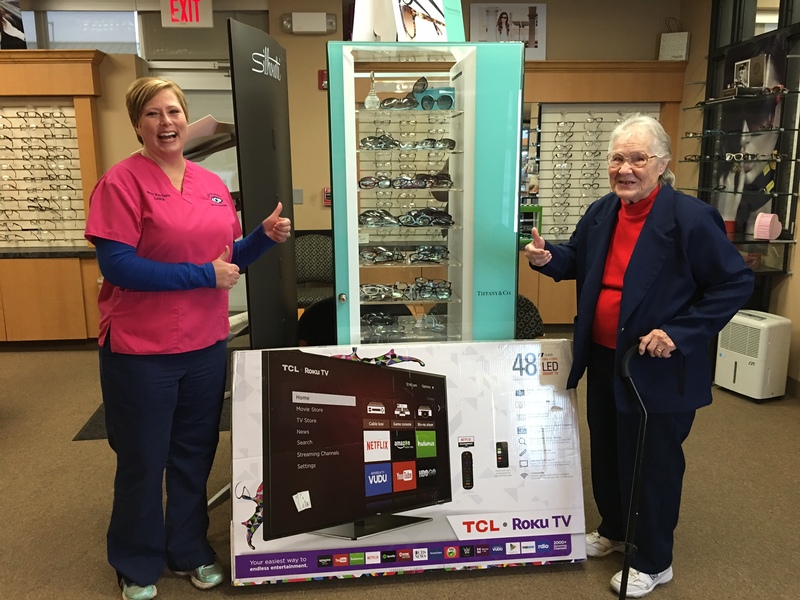 Grin Eye Care Gives Away a 48" LED TV! Congratulations to our sweepstakes winner, Dorothy Schulz! Dorothy was able to enjoy watching the Chiefs during the playoffs on her new 48" LED TV, courtesy of Grin Eye Care. The size of the TV made Dorothy feel like she was "at the game." Grin Eye Care sent out postcards all over the KC area with a message to bring the card in for a chance to win the television. Dorothy brought hers to our Olathe location and was randomly selected! Watch for postcards from Grin Eye Care in your mailbox and like us on Facebook for a chance to win other exciting items in the future. Past giveaways have included designer sunglasses from our optical shop, mini iPads, and free LASIK!